Situated at the top of The Three Valleys, Val Thorens - at 2300 metres the highest resort in Europe- offers a complete range of skiing. Thanks to the altitude, it's pretty much guaranteed snow from the end of November through to the beginning of May. When will it snow in Val Thorens? The next notable snow forecast for Val Thorens is 6cm3in, expected on 24 April, with around 22cm9in forecast over the next 7 days. How High is Val Thorens? The French Ski Resort of Val Thorens is part of the Three Valleys ski area with access to 600km373 miles of downhill skiing, with 497 marked pistes, served by a total of 180 ski lifts. In addition to the skiing in Val Thorens itself (140km87 miles of pisted ski runs), the appropriate ski Lift Pass will allow you to ski or snowboard in the other Three Valleys ski resorts of Courchevel, La Tania, Les Menuires, Méribel and Saint Martin de Belleville. The ski resort itself is at 2,300m7,546ft, so skiing or boarding back to the resort is usually possible. With ski lifts as high as 3,200m10,499ft, skiing and snowboarding is assured throughout the season. Val Thorens represents the pinnacle of ski resort development to date - at least in terms of its altitude. The highest ski resort in Europe, located in a vast snowy bowl within the biggest ski area in the world. Today it can claim to be a stylish 'village' and world class ski resort rather than a clutch of rather desolate, high altitude buildings as some imagine. The resort has been renewed using local wood and stone to designs inspired by traditional local Savoie architectural tradition. More than 250 Million Euros have been spent in recent years in improving and expanding the resort and the local ski area. The whole has also been designed to a well-considered plan giving it a compact, largely pedestrianised centre where most of the public facilities (of which there are many!) are concentrated. This investment has helped the constant popularity of Val Thorens which now attracts some two million visitors annually (placing it in the world top 20 ski resorts by popularity as well as altitude) . It also boasts occupancy rate of around 90% on average through the season, making it the envy of many other famous ski resorts. Val Thorens is also a pioneer of ultra-stable funitel lifts - large gondolas running between several parallel cables like cable cars, rather than just one, but continuing to circulate like a gondola rather than going back and forth like a cable car. The resort keeps installing ever more of these lifts which is particularly good news at such high altitudes. Despite being north facing, the resort's altitude ensures it gets good sunshine with little over-shadowing it. The longest possible descent in Val Thorens is 12km7 miles long and the most difficult run is the 'Caron', which is 3km2 miles in length. Located at the top of the world's biggest ski area, guests at Val Thorens have doorstep access to up to 600km (375 miles) of piste divided in to nearly 300 ski runs for all standards, served by 200 lifts. Due to the resort's altitude, skiing can be offered for six months of the year, normally from November, if conditions are right, to mid-May. Val Thorens has a modern and efficient ski lift infrastructure with a number of Funitel style lifts (high speed gondolas). All levels of skiers have a seemingly endless choice of skiing. Beginners will find many wide gentle slopes around the resort itself especially for them, with some lifts free for first-timers. There is a 40 hectares area for beginners, equipped with no less than four roof-covered magic carpets. The area has been designed not only to provide first-class facilities for first timers, but also improved access to the Cascades chairlift, getting progressing beginner skiers on to more green and blue slopes. Intermediate level skiers have the most choice of all with over 200 runs in the Trois Vallees categorised Red or Blue. Skier numbers are dispersed throughout the area making queues a rarity, and allowing lots of mileage to be clocked up! It's perhaps advanced and expert winter sports enthusiasts who will feel the benefits of the area the most, simply because such a choice is more of a rarity for them. They will be drawn to the powder fields on the Peclet and Chavière glaciers and the famous mogul slopes of the Cîme de Caron black, and they're just for starters. The French ski school, with around 200 instructors, offers tuition in all disciplines, including Moguls and Telemark. The main snowpark is situated on the Plateau sector and is accessed by several ski lifts. 5 zones (beginners, intermediates, experts, Boarder-Cross and Jump Air) make up this large area filled with different fun modules: raised bumps, whoops, hand rails, boxes, a table top, wall ride and a big air. When is Val Thorens open? We don't currently have confirmed season dates for Val Thorens. NOTE:- Lift and Piste openings are always subject to Snow Conditions in Val Thorens. Val Thorens is able to make snow, on 100km62 miles of ski runs, with 395 snow cannons. The 29 ski lifts of Val Thorens are able to uplift 53,000 skiers and snowboarders every hour. Val Thorens is in the French Alps in The Three Valleys, Savoie, France. The nearest airports to Val Thorens are Chambery, Annecy and Geneva. There are five airports within three hours drive. Highly regarded for its après ski options, Val Thorens has over 130 bars and restaurants to choose from, along with a sports centre and swimming pool and a cinema which shows films in English. You can also try the longest toboggan run in France, ice driving, snowmobiling or check out the bowling complex with pool hall. About 70% of guests at the resort are non-French, with a good proportion of those being German or Dutch, thus helping to contribute to a lively atmosphere at venues. The Malaysia has a reputation for live music and there are several nightclubs. Val Thorens has continued to evolve since its opening in 1971. It was one of the first ski areas to offer Wi-Fi internet access back in 2003. Want to Know when it Snows in Val Thorens? 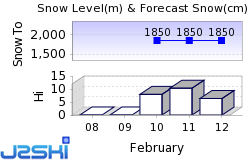 Click above to get Snow Reports by e-Mail for Val Thorens. By doing so, you agree to Our Rules. Other Ski Areas within The Three Valleys. 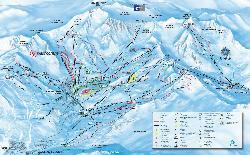 Other popular Ski Areas near Val Thorens. Common questions about Val Thorens. Want to ask about skiing and snowboarding in Val Thorens? Or contact Val Thorens Tourist Office.